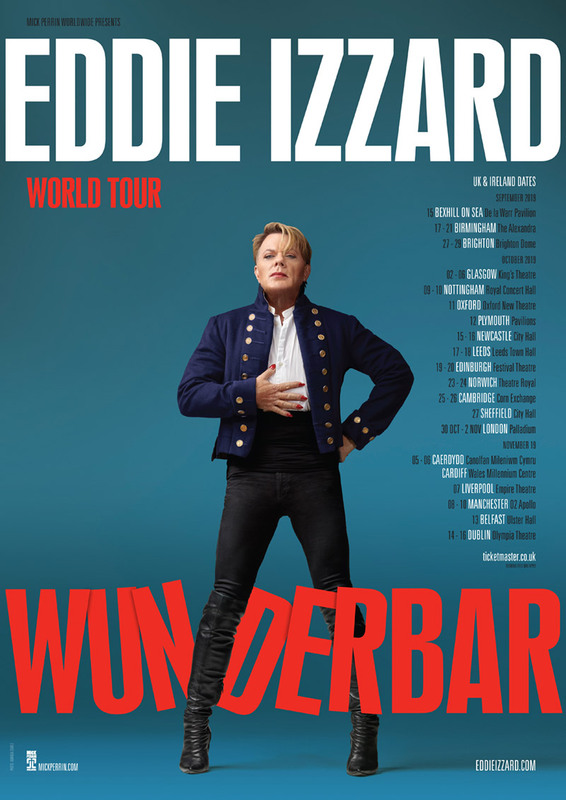 Today Eddie announces U.S. tour dates for his Eddie Izzard: Wunderbar international tour, opening May 8 in Nashville with his final U.S. performance on July 13 in Seattle. Tickets are on sale today for the first 43 US dates, across 26 cities from New York City to LA, and many places in between. See show information here. Wunderbar began life at La Nouvelle Seine, a floating theatre in Paris on the Seine where Eddie began to improvise his new show in French. He then flipped countries and continued developing the show improvising in Berlin in German. Now after more development in English, Eddie is ready to share Wunderbar with the world… But will make sure the language fits the country! Ticketmaster Pre-sale - Tuesday 27th Nov 10am. General on sale - Thursday 29th Nov 10am. Wunderbar European Tour Dates Announcing Soon - Watch This Space! Wunderbar will be coming to Europe in March and April 2019! Wunderbar began life in Europe at La Nouvelle Seine, a floating theatre in Paris on the Seine where Eddie began to improvise his new show in French. He then flipped countries and continued developing the show, improvising in Berlin in German. Now after more development in English, Eddie is ready to share Wunderbar with the world. Keep checking the Shows page for the latest dates and ticket info. Featuring a bit of stand-up, sharing personal photos, discussing his personal and professional life, reading from 'Believe Me' and answering questions from the audience, each show promises to be an intimate, unique experience. Tickets can be purchased through the links on this website. Eddie's autobiography, Believe Me, a memoir of love, death, and jazz chickens, is available today in hardcover, audio and Kindle editions. Brimming with the surreal humour and disarming candor of his shows (with occasional digressions), Believe Me tells the story of a little boy who lost his mother yet who has risen to become a star of comedy and drama, a leading advocate of total clothing rights, a British European and extreme runner of marathons, who bestrides the world stage as a world stage bestrider. Lassen Sie sich in die Mailingliste eintragen. Erfahren Sie als Erste(r) aufregende Neuigkeiten wie z. B. Tourdaten.